This post is the second in a three-part series on reading scientific papers in astronomy. In today’s post, we will go over different places to discuss papers and keep up with recent scientific literature. You may already know that your department holds weekly colloquia where they bring in speakers from other institutions to give talks about their research. Here is everything else going on in your department you should want to know about. Some of these events give you a better opportunity to participate in discussions or to see what your colleagues think about someone else’s research. Whether you know it or not, your institution probably has a meeting time for discussing papers called something like “astro-ph coffee.” Most departments schedule these gatherings at least twice a week for about a half hour. They are intended to be an informal setting for students, post-docs, and faculty to discuss the results and merits of the latest papers. They are also intended to have coffee. You can go just to listen to others talk about papers, or even to take part in these discussions as well. If you read an interesting paper, you can also present it and learn more about the topic as others ask you questions and/or point out comments and critiques you may not have thought of. And if you publish your own paper, astro-ph coffee is a great place to practice presenting it, especially if you are going to give a more formal talk at a conference. A good discussion of another paper or your own might turn out to be a stepping stone for thinking of a new research idea. Who and how many people attend can vary greatly from place to place and even day to day. As a result, the types of discussions that happen and the research topics can also change from one gathering to another. The best way to grasp the format is to check it out for yourself! Figure 1. 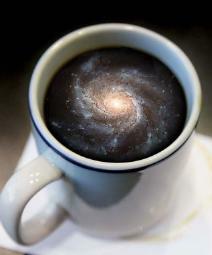 Coffee for an astronomer. The spiral arms give it that extra bit of flavor. Credit: The OSU. If you can’t make it to astro-ph coffee because it conflicts with a class time, you can still see what people are discussing on VoxCharta. 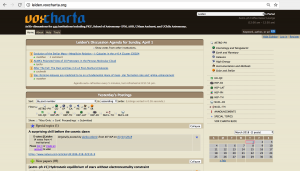 Over 400 institutions use VoxCharta to vote on which papers to discuss at coffee. By creating an account under your department’s name, you can track which papers are being discussed and who is leading the discussions. If you choose to present a paper, this website is likely where you would make a nomination. In general, you can also see which papers have the most votes between every astronomy department in the world that uses VoxCharta (see Figure 2). Figure 2. 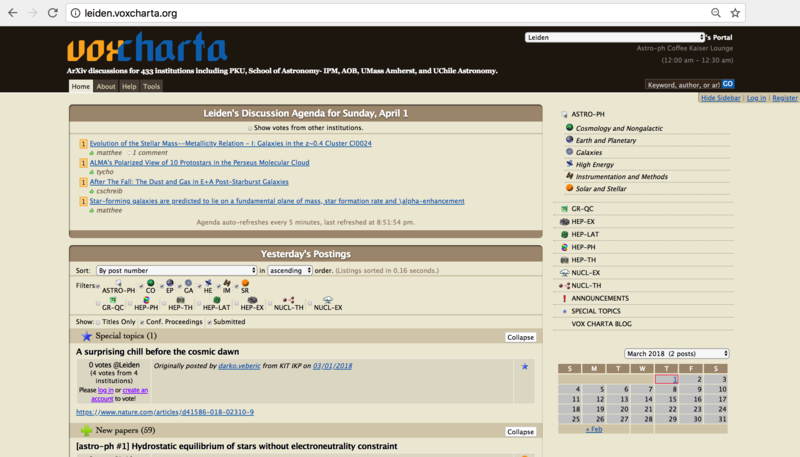 VoxCharta home page for Leiden. A few people have nominated four papers to discuss. If you click “Show votes from other institutions,” you can see which papers have the most votes amongst all institutions. Full size image here. Journal clubs and topic lunches fall in-between astro-ph coffee and department colloquia in terms of formality. They are like colloquia in the sense that one speaker (or sometimes two) gives a talk that is largely interrupted. At the same time, they are more informal in that if someone asks a question, it may also lead to a lengthy discussion – like with astro-ph coffee. These lunch talk series also leave more time for people to ask questions at the end, while also tolerating some interruptions during the talk. Since these talks are more informal, they can serve as a friendlier setting to practice asking speakers questions before trying that out at colloquia. Whereas astro-ph coffee consists mostly of people at your department and department colloquia are given mostly by speakers from other departments, lunch talks tend to have a mix of both throughout the semester. Like colloquia, these talks can be a great way to meet people from outside your institution. If you are working on a research project in your department, your advisor is likely part of a research group that holds group meetings. While not all professors choose to lead these, the majority partake in either a small group meeting (e.g. a professor, their students, and their post-docs) or a very big group meeting (e.g. every professor that works on instrumentation, all of their students, and all of their post-docs). Ask your advisor if you can attend! In general, group meetings focus on their members’ own research. The format of these meetings can vary a lot from group to group, and also meeting to meeting. Some days will feature someone presenting a project they are in the middle of working on — looking for feedback on which possible research directions can lead to an important result and which are not worth exploring, or just looking for new ideas in general. Other days can involve members discussing papers related to their current projects. Attending these meetings as an undergrad can give you an idea of how you will be expected to contribute by the time you get to grad school. You get to see what other research projects look like before they are finished. More importantly, you also get the chance to see how a higher-level researcher in your group tries to make progress on their project. It is often not as straightforward as you might think! Seeing these things can help you gain a better perspective on what to think about and what questions to ask when reading papers. It can also improve your perspective on your own research project. Figure 3. 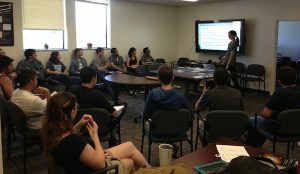 Professor Jocelyn Read presenting at a large CSU-Fullerton gravitational waves group meeting, which includes three faculty members along with their students, post-docs, and research staff. Which of these events should you attend? By the time you are a graduate student, you will probably be involved in discussing papers in most, if not all of these places. As an undergraduate, you should still be focused on classwork (and possibly a research project) during the academic year. Nonetheless, going to these events once in a while can help you in the long run. Whether you can attend any of astro-ph coffee, journal club, topic lunches, research group meetings, or department colloquia might depend on your schedule. You may like one of these events more than the others. If you are unsure, try them out! You can also ask your advisor for advice on what is best for you. Stay tuned for the final post in the series on miscellaneous tools for reading papers!